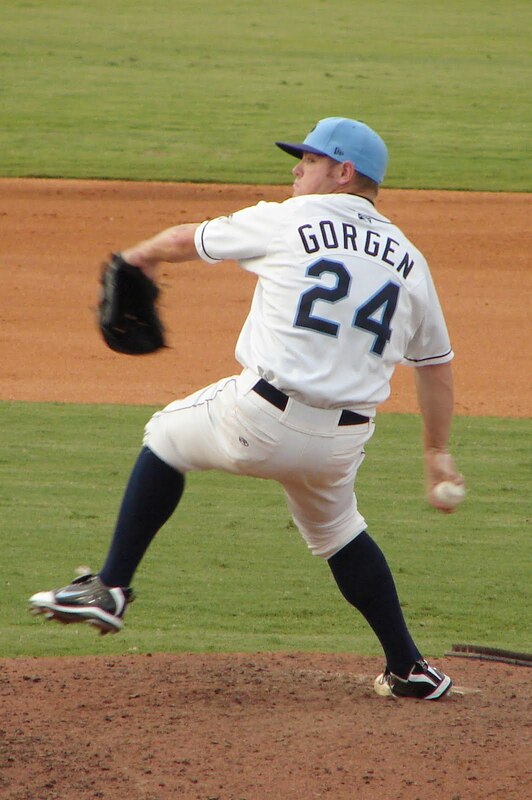 MONTGOMERY, AL – Matt Gorgen wiggled his way out of a bases-loaded jam in the ninth inning by striking out the side, and Greg Sexton clubbed his first homer of the season as the Biscuits (18-14) held on to a 5-3 win over the Huntsville Stars (17-16) on Wednesday night at Riverwalk. In the second inning, Huntsville used an Alex Cobb error to plate two unearned runs. After a leadoff double from Andy Machado, Juan Sanchez grounded out. Then on a fielder’s choice bouncer from Chuck Caufield, Andy Machado was caught between third and home and tagged out by catcher Nevin Ashley. The Cobb error came on a grounder to first from Brent Brewer, with Cobb dropping the throw from Fields while covering first. Caufield scored on that play, and Brewer would score on a double from Martin Maldanado to make it 2-0 Stars. Drew Anderson tripled to left-center with one out in the Biscuits’ second, then Cody Strait ended a Biscuits record-breaking 0-28 streak with an RBI single to left. John Matulia followed with a two-run homer to right field to give Montgomery a 3-2 lead. Machado doubled to start the sixth and scored on a Caufield single to tie the game at 3-3. But again the Biscuits answered promptly. After Nevin Ashley led off the bottom of the sixth with his third single of the day, Sexton sent his first homer of the season over the right field wall to put the Biscuits in front 5-3. After the Stars had loaded the bases in the ninth, Gorgen (7) struck out Chris Errecart and Andy Machado to wrap things up. Anderson and Matulia each had two hits for the Biscuits to follow Ashley’s three. Cobb took a no-decision in his first start at the double-A level, allowing two unearned runs on five hits while striking out four and walking one in his four innings. Darin Downs earned the win, allowing one run on three hits in 2.2 innings of relief. Huntsville starter Chris Cody allowed five runs on nine hits and was tagged with the loss. LHP Alex Torres throws for the Biscuits on Thursday night against Huntsville ace Amaury Rivas, with the first pitch on 80’s Night in the air at 7:05.